Every noodle-eating country has its own beef-and-noodle dish -- each dramatically different from the next but related all the same. Russian stroganoff arose a little after France's beef bourguignon and Italy's ragu. China's beef lo mein was likely served before both -- but they consist of the same base ingredients. Variants on a dish arise from the originals -- find a technique and flavor profile you like and make your own. Classic beef burgundy exemplifies simplicity, rusticity and heartiness, as intended. Render the fat from about 1/2 pound of chunky bits of slab bacon over low heat and set the meat aside. Brown 3 or 4 pounds of stew beef in the fat along with garlic and sliced onions. Add enough equal parts red wine and beef stock to cover everything, then add herbs and spices. Braise the beef for three to four hours in the oven at 250 degrees Fahrenheit -- just enough heat to simmer. Serve the beef with caramelized pearl onions, bacon, sauteed mushrooms and buttered egg noodles with parsley. Eastern and Western cuisines share a fondness of beef and noodles, but cultural differences show up in the preparation. The iconic Chinese beef-and-noodle dish -- beef lo mein -- is stir-fried and spicy. Marinate sliced flank steak in equal parts soy sauce, sesame oil, shaoxing wine and sugar for two hours. Cook lo-mein noodles and set them aside. 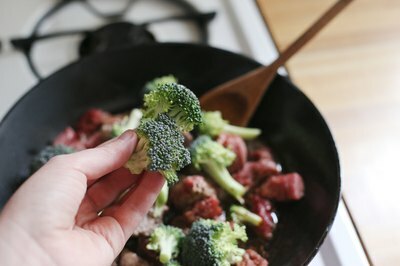 Saute the steak, broccoli and garlic in a wok over medium-high heat. Finish by adding the noodles and a little reserved marinade and cooking it all for two to three minutes. Beef stroganoff has origins in 19th century Russia, but the dish spread rapidly throughout Eastern Europe. Kluski, a Polish dish, and goulash with egg noodles, from the Czech Republic, both were inspired by stroganoff. 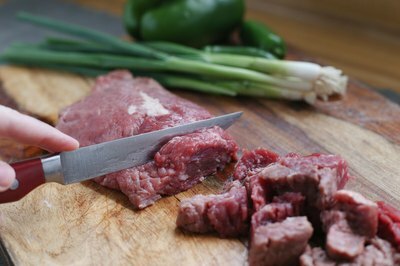 Slice the beef -- a tough cut, such as round -- into 1/4-inch thick slices and saute them in oil until browned, about two minutes. 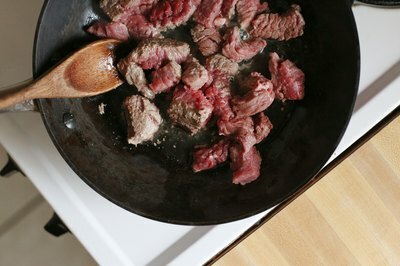 Set the beef aside, add butter and saute sliced mushrooms and diced onions in the pan. Add a little flour and stir, then whisk in equal parts stock and sour cream and simmer until thickened, about five minutes. Add the beef to the sauce, heat through and season to taste before serving over noodles. Italy's iconic beef-and-noodles preparation -- ragu alla Bolognese tradizionale -- is not tomato sauce and fried hamburger, but more of a slow-cooked heritage dish closely related to beef bourguinon. Classically, Bolognese calls for coarse-ground beef; make this at home by roughly chopping a tough roast into 1/4-inch pieces or smaller. Mix equal parts ground pork and beef with enough white wine to coat them, then add pureed garlic and pancetta until a paste forms. 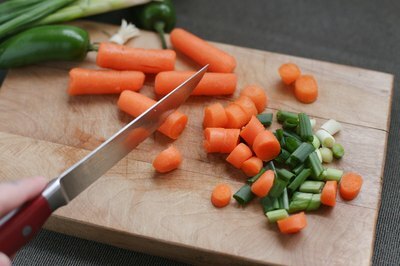 Saute the paste over medium-low heat, then add two parts diced onions and one part each diced carrots and celery. Cook the vegetables until brown, add the meat and cook for about 30 minutes. Cook the meat until the liquid evaporates and add enough stock, crushed tomatoes and tomato paste -- along with herbs and spices -- to cover. Cover the pan, set the heat to low and cook the meat for two hours. Season to taste during cooking, and serve over hot pasta.